Natural stone statues have been made for over 30,000 years. Statues of small pieces of natural stone are made only since the beginning of this millennium. It's not a special technique, you see in the photos. 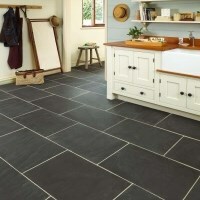 It is the passion of a man for natural stone, in this case for slate. 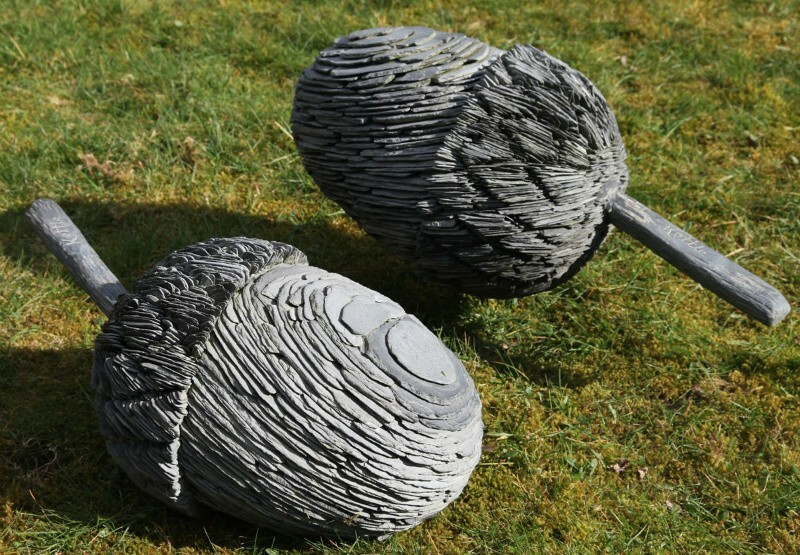 Stephen Kettle is a British sculptor who found in slate not only the strength of a tough natural material but also the significance of these textures. 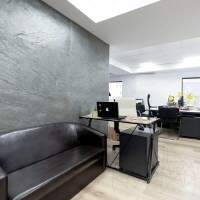 Attractive textures found in all types of slate: decorative slate or SKIN flexible slate. 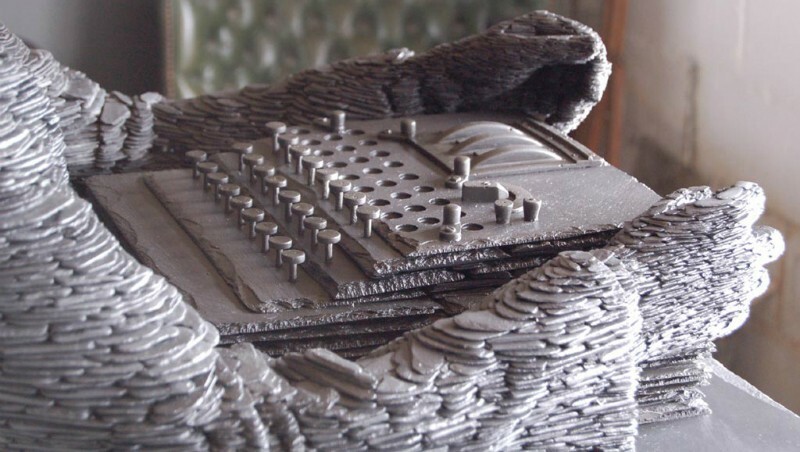 So, this is the amazing art of slate sculptures! "No substance on earth, natural or man-made, expresses beauty better than slate. When it is dry, slate is silky and shines when it's wet. It splits perfectly, making slate unique in terms of durability" said Stephen Kettle in an interview. Stephen Kettle was born in 1966 in Castle Bromwich and, after seven years of Royal Navy, has worked for over 15 years in constructions with his father. He tested several jobs, most of which working in the field of interior finishes (painting, installing wallpaper etc.). It is worth remembering this detail: his experience with the wallpaper, hence the attraction but also the ability to paste and imagine objects by bonding them together. In the early 2000s he developed his own style and technique to create statues. Probably Stephen Kettle's art is all the more appreciated by the way he most often chooses to give his work the form of human body over the non-figurative, abstract structures so widespread in contemporary art. Kettle has become a sculptor following a happening that has radically changed her life. In 2002, he witnessed a tragic event, while he was a member of the Oxford Dangerous Sports Club. A young man of only 19 years loses his life during an attempt to fly over the Thames, thrown out of a catapult like those in the middle ages. And Kettle flew over Thames in the same charity event. In order to prove his entrepreneurial spirit and adventurer at the same time (but in a less risky form, we should add! 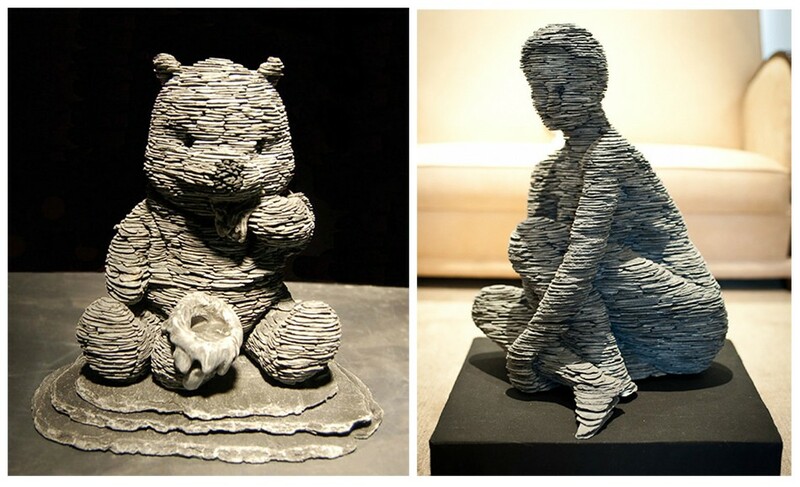 ), he decides to dedicate himself to the sculpture using slate plates. He had discovered this passion in a holiday with his family. 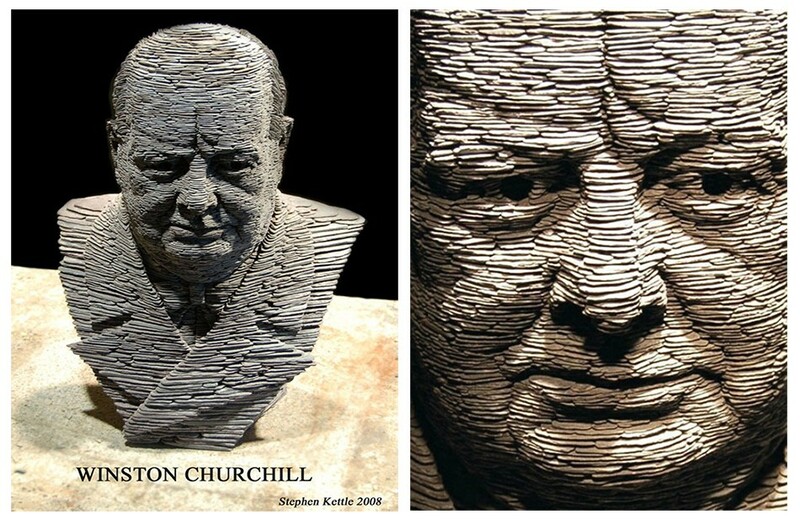 Stephen Kettle uses in his art various types of slate, brought from different parts of Wales. He works 60 hours a week, dedicating a lot of time to slate processing for bringing the pieces to the desired size. Work has to be extremely difficult if we consider the hardness of the material, although, being very compact, the strips can easily detach. Beyond talent and creativity, his important creations are infused by a definite attitude: patriotism. 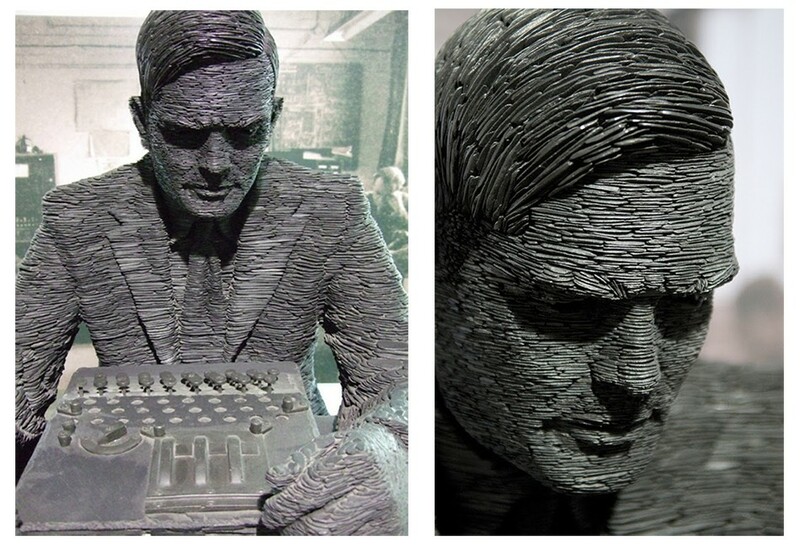 Three of the sculptures that made Stephen Kettle famous include three great British personalities who have historically marked the recent world history: Winston Churchill, Alan Turing and R. J. Mitchell, designer of the Spitfire fighter plane. 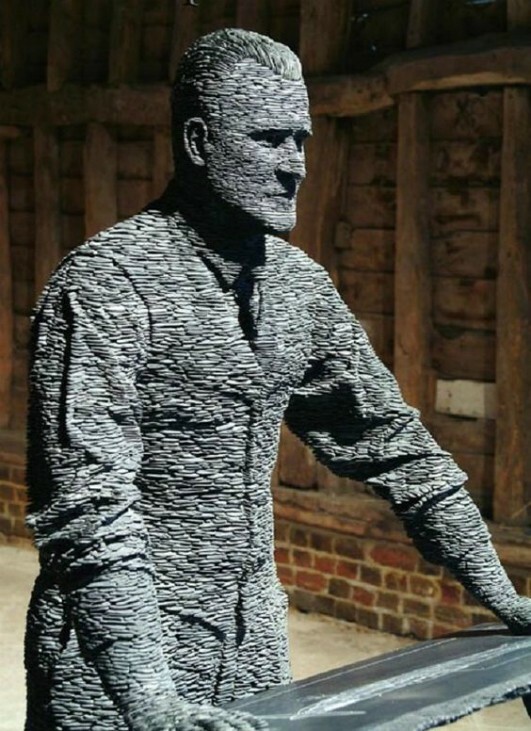 Creating the statue of R.J. Mitchell took over 2,000 hours and is displayed in the London Science Museum. Rediscover the charm of slate by visiting sections of slate-based PIATRAONLINE products: slate splitface cladding, SKIN flexible slate, and slate tiles. To find out more about the art of interior and exterior design, slate or any other type of natural stone, we are looking forward to hear from you over the phone at +40318.222.333 or by email at export@piatraonline.com. We wanted to offer you the option to transfer your passion for design and the joy of giving into something more than a gift: we wanted to give you endless opportunities. This year, November 16 becomes EXTRA Black Friday at PIATRAONLINE, an even darker Friday for prices, with more discounts on your favorite materials. Constantin Brancusi – the sculptor of Romanian soul – a name that has completely transformed modern art and the approach on abstract sculpture. When you think about abstract sculpture, what is the shape that first comes to your mind? What about when trying to visualize the man behind the abstract, how do you imagine him? Emotion does not exist only as a statement or a brief gesture – emotion is everywhere and comes associated with inspiration. It's that affection that brings us into a state of well-being, even for a few moments. What we want to transmit is that such an emotion can be found even in a space where you drink your morning coffee or enjoy a good lunch. Inspiration is all around us – from the environment up to the tangible assets. And even the experts of planning and designing, architects, need inspiration for their projects. Your home is a personal retreat – a place where we can be ourselves and forget about everything. That’s why decorating such a space will not be as easy as it may seem. More difficult than choosing a living room sofa or your favorite bathroom material, there is something more that complicates our choices. PIATRAONLINE is the first online store for natural stone, arrived on the market in a time when clients were neither accustomed nor ready to shop online, particularly in this domain. However, it has been over 10 years since that time and the prospects for the design and construction market have radically modified. 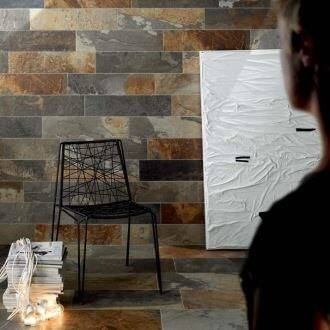 Seeing and touching natural stone is not enough; you must understand its potential. For such a journey, you will need professional and customized assistance.